It’s early on a Saturday morning and Victor Juarez, 16, goalkeeper for the El Camino Real Futbol League is on his way to a team breakfast followed by a practice session with the San Jose Earthquakes Youth Academy. San Jose is more than an hour away from Salinas, California where Juarez spent six years developing as a player through the El Camino Real system. Training with a Major League Soccer team’s youth academy is just part of a dream come true for Juarez, who has made a verbal commitment to the University of Portland in Oregon. Graduating from college is the other. Founded in 2006 by Carlos Rubio and Richard Mussalem, El Camino Real has become a substantial youth league, with 15 teams that on any given day serve up to 230 local youth. Soccer has been a big motivator for Karina Briseño, who at 15 was captain of the Thundergirls, an El Camino Real team for girls under 17. At Alisal High School, Briseño took AP classes in physics and math, and her parents required her to get good grades, “at least a B,” she says, in order to be allowed to play. “I have straight A’s right now so it’s not really a problem.” Studying mechanical engineering at Hartnell College, Briseño is 18 now, and happy all that hard work is showing dividends. 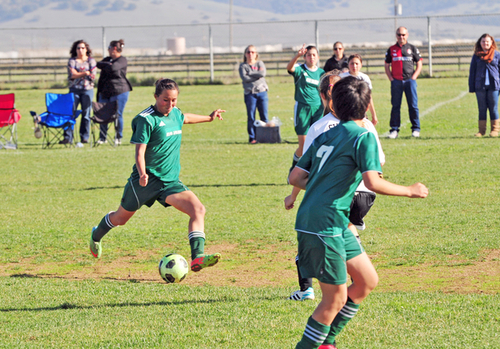 Down 2-0 at the half in their final tournament game of 2014, team captain Karina Briseño of the U-17 Real Salinas Thundergirls helps her side roar back to tie the game and retain first place. On a sunny Saturday, the Thundergirls were doing pre-game warm-ups at Bolsa Knolls Middle School in Salinas. The girls stretched and jogged, then practiced their passes, while coach Alonso Marquez shouted encouragement. The league gives young players the chance to play in a more competitive atmosphere, challenging them to be better players and people, Marquez says. League co-founder Carlos Rubio points out that “soccer is a game that offers opportunity to everybody,” a great leveler where, since height and weight aren’t necessary, all that matters in the end is skill, and heart. That, he implies, is something the kids in Salinas have in great measure. 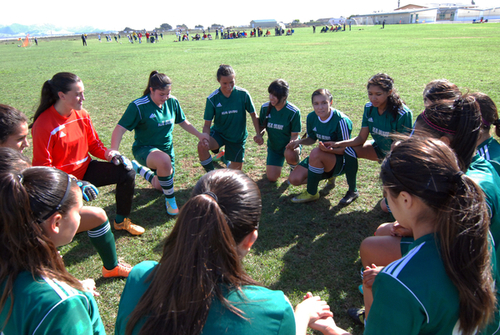 The U-17 Real Salinas Thundergirls say a prayer together before their final tournament game of 2014 versus San Bruno at Bolsa Knolls Middle School in Salinas. “Most of our kids come from farmworker families, and as we all know, it’s hard to earn a decent wage, to make a living as a farmworker,” says Mancera, who grew up in nearby Chualar, a small agricultural community south of Salinas. Judging from the quiet confidence of leaders like Victor Juarez and Karina Briseño, the young players of El Camino Real Futbol League are well on their way. 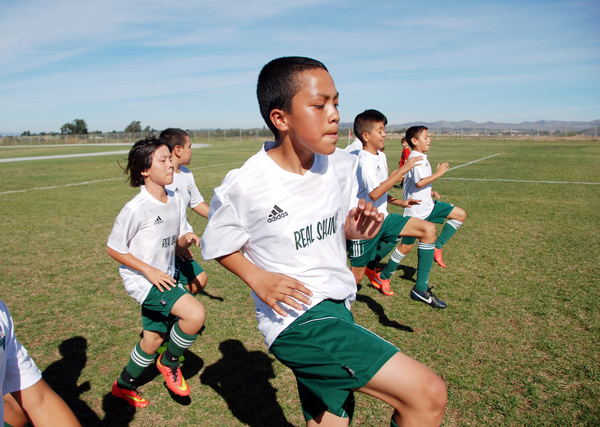 For members of Real Salinas United, the boy’s U-12 team, conditioning is everything for this warmup session at Bolsa Knolls Middle School in Salinas before one of their final tournament games for 2014. For more information about El Camino Real Futbol League, visit www.elcaminorealfutbol.org.